Most of us would agree that a ten-acre homestead demands a certain amount of ruthlessness—and a whole lot of whacking. 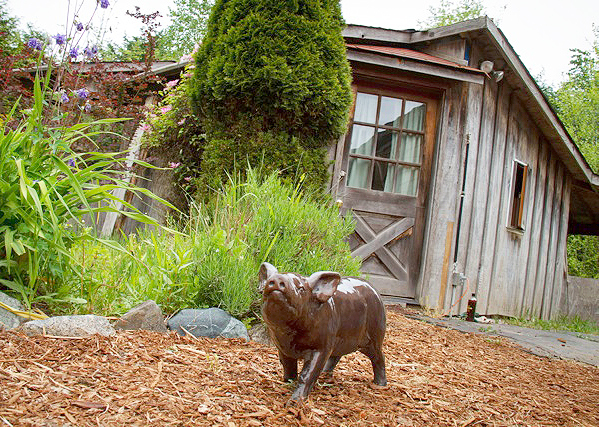 Gerber and her husband Randy Hudson moved to Whidbey Island in 1982, intent on building a house, an artist’s studio and a foundry for casting bronze sculptures. Once the couple had cleared an acre of the alder trees that dominated the property, they began to construct their rural retreat. Eventually they added more outbuildings, including a stable for Gerber’s horse (and a pony to keep the horse company). The surrounding garden—broad, sweeping swaths of plants that flow like a river—evolved slowly and in a way some gardeners would consider haphazard. Perhaps this lack of advance planning isn’t surprising coming from someone with a heightened ability to visualize in three dimensions. When beginning a new sculpture—regardless of its scale—Gerber seldom draws or makes models. 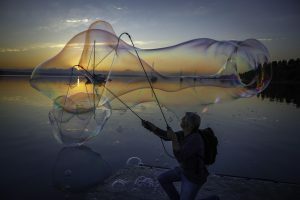 Rather, she begins by working directly in the clay from an idea in her head, refining and changing until she is satisfied with the final image. The piece is then molded and continued through additional steps to create the piece in bronze. This complicated and laborious procedure involves constructing more molds made of sand, plaster and vermiculite. Metal, heated to blistering temperatures, is poured into the molds. The cooled sections are then welded together and tooled. Finally, the patina of the piece is developed with chemicals before being buffed with wax. 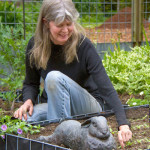 According to Gerber, gardening liberates her from all that. 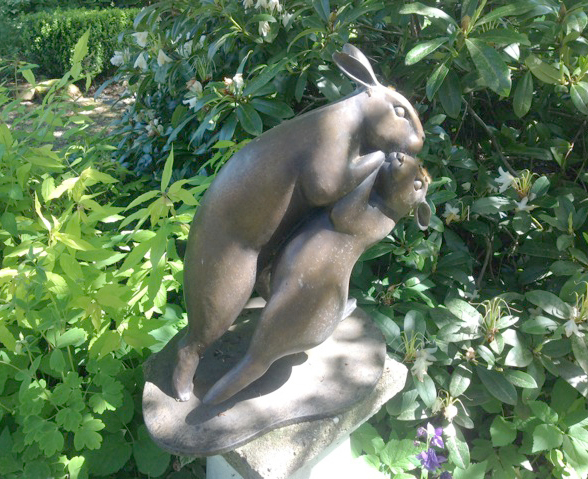 As a sculptor, Gerber works in “editions” of 15. 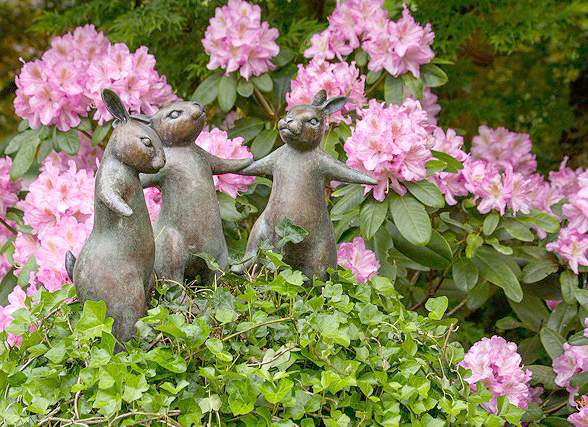 Gerber and Hudson keep the last piece of most editions, and some of those are permanently placed in her garden, making it a kind of Noah’s ark of creatures large and small. 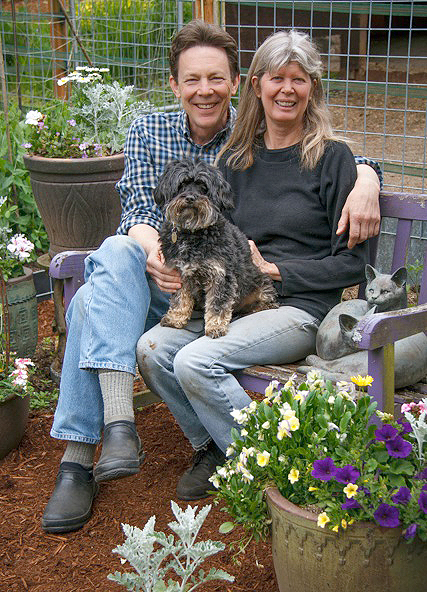 When Gerber walks through her garden, it’s like walking through her own evolution as an artist. 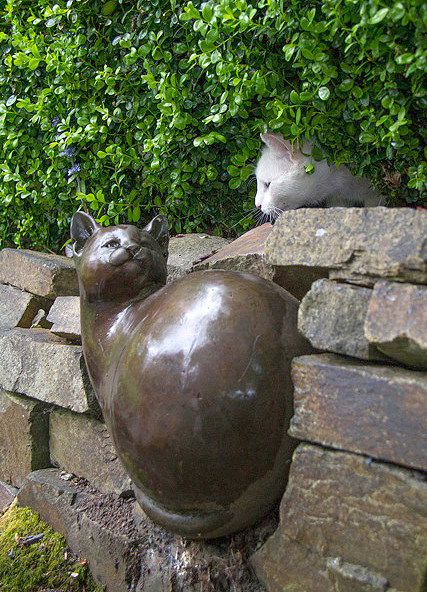 Georgia Gerber’s sculptures are situated in outdoor settings all over the country. While some are faithful representations of the creatures of the natural world, others are fanciful: a boy riding a bear, a girl reclining against a rabbit four times her size. In those settings—beach, park, library entrance—a Gerber sculpture confers a sense of magic. 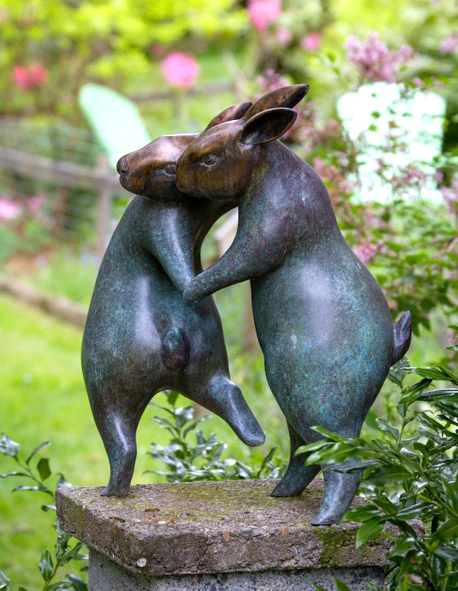 In no place is that sense of wild whimsy more apparent than in the sculptor’s own garden. To look around at cats curled up in the ivy and rabbits cavorting among the fronds, you’d never suspect that the woman responsible for this bucolic Eden was anything but bountiful and merciful. But look again at the relationship between sculpture and plants, between hard and soft, between enduring and fleeting, and you’ll probably come to the conclusion that a little ruthlessness can be a good thing. 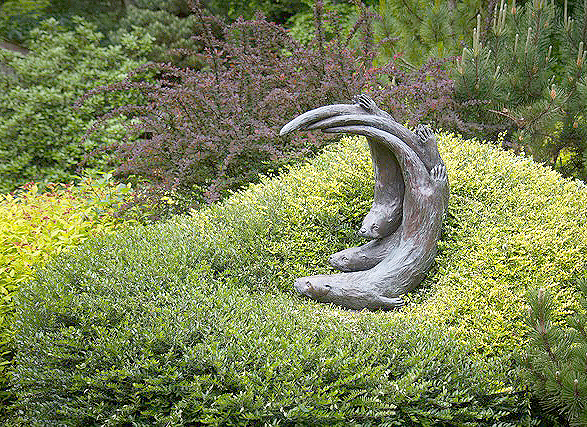 See more of Georgia Gerber’s sculpture in the Whidbey Life Magazine May Virtual Gallery show or visit her website: www.georgiagerber.com. Reading this story and seeing Georgia’s work is a delightful addition to my morning. Thanks!